The Sharna and Irvin Frank Foundation was created to assist both Jewish charitable organizations and non-Jewish charitable organizations. Generally, the foundation makes grants for operations rather than capital or building campaigns. Our focus is to support smaller, grassroots organizations for which the grants will truly make a difference. 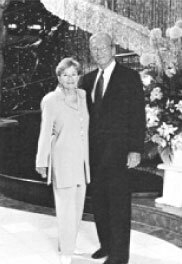 We are a private foundation, founded by Sharna and Irvin Frank, which was created to carry on their lifetime of philanthropy. The Sharna and Irvin Frank Foundation exclusively funds organizations with 501(c)(3) status determination from the Internal Revenue Service. We are based in Tulsa, Oklahoma, and our areas of support include social services for those living in poverty or have physical and/or mental challenges, education programming for K-12 to assist at-risk children, health care programs (other than hospitals) for those living in poverty that includes mental health and crisis intervention services and various arts organizations. NEW FOR 2018: Geographic areas of funding are limited to the Greater Tulsa area with preference to the City of Tulsa and some limited funding in Israel.